Controversial plans to nearly double the size of Rochester Prison have caused more anger because of the number of floodlights proposed. The Ministry of Justice (MoJ) now wants more than 210 security lights on the young offenders' institution instead of the 127 on the original plans. Neighbours claim they will be living in almost permanent daylight if plans are approved by Medway Council next month. The MoJ said it was having discussions with residents and planning officers. The government wants to increase the size of the Kent jail from 392 to 700 inmates. 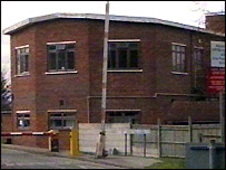 Building work began in March 2007, but was suspended because planning permission had not yet been granted by the council. The changes to the lighting and a reduction in landscaping have appeared in a planning application to be considered by the council next month. Resident Samantha Clay said the extra light pollution would have a huge impact on the prison's neighbours. She said: "It would affect the health of residents and the quality of our lives generally to have these security lights shining on the back of our homes." Councillor Mark Reckless said the MoJ had made some concessions. "Within the prison we have had a lot of the buildings reconfigured and a huge sports hall moved so it is not as close to residents," he said. "Some residents have been able to expand their gardens, which has been popular. "We are just asking the MoJ to take residents' concerns into account and not ride roughshod over them." The Home Office said in a statement: "We are having ongoing discussions with the local planning officers, the residents and their lighting engineer about the lighting scheme. "We hope to reach a satisfactory outcome in due course."